Email marketing could be the single largest revenue driver your restaurant business. It’s as simple as that! If you’re short on time but want to consistently connect with old customers and bring in new ones, email marketing could be the answer you’ve been waiting for. Despite the growth of social media and other marketing channels, the use of email marketing still has a large role to play when it comes to customer acquisition and relationship building. Email is a cost-effective and powerful marketing tool that delivers a massive return on your investments in it and help you grow your restaurant business efficiently. It can help increase sales; boost your revenue and profits. Studies have shown that for every $1 spent towards email marketing, you can expect an average return of $38. Although there are many advantages to using email marketing to grow your business, this specific return helps to keep you in business and can become a consistent way to engage with customers. Moreover, Forrester statistics show that people are twice as likely to sign up for your email list as they are to interact with you on Facebook. So, if you can give them a reason to share their email address just once, it raises the possibility of them joining your list. You could even begin by getting your existing Facebook fans onto your email list. In this article, I’ll focus on benefits of email marketing; and more specifically why you need to use it for your restaurant. Get your customers more excited by sending them new updates about your restaurant. Have you got a new menu item, coupon, or location? There is no better way to reach out and let people know that through email. It’s an effective way to raise their level of emotional engagement, build a lasting relationship with them and get them involved in your restaurant or food business. Email marketing is based on customer interaction. Statistics show that 61 percent of consumers enjoy receiving promotional emails weekly, and 38% would like emails to come even more frequently. The determining factor is whether they enjoy their experiences with you or not. When you build up excitement with your updates, your customers are more likely to act immediately. They’ll want to visit the restaurant to check out what’s new, or even visit your new location to see in person! Building up excitement with emails can help customers make fast decisions based on your updates. Sometimes, it’s much easier to retain an existing client than acquiring new ones. 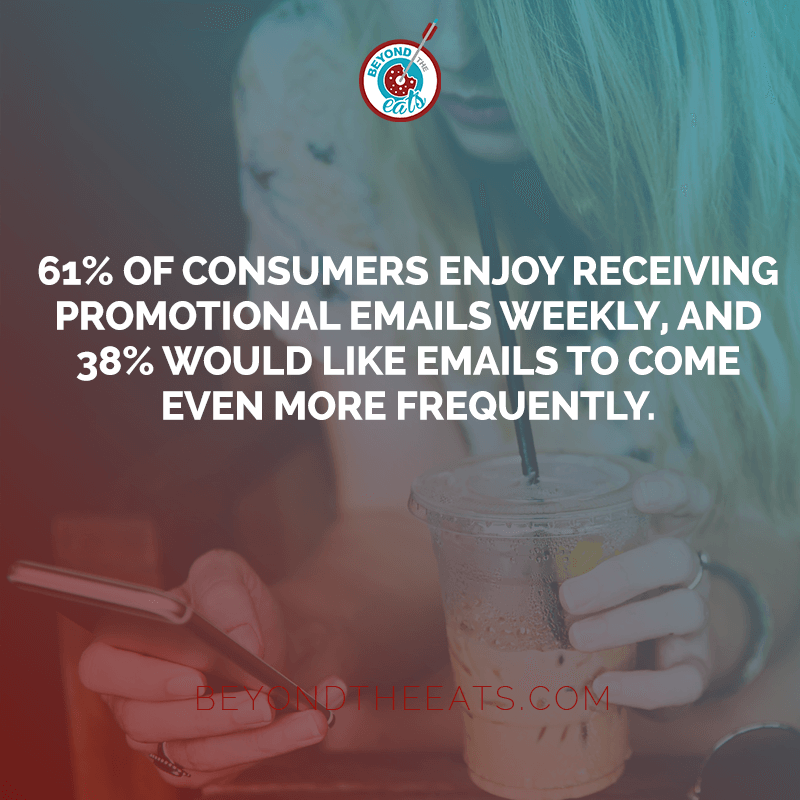 However, with email marketing, restaurants can easily connect with new prospects, clients, or subscribers. When you offer people exclusive access to deals or offer them new deals such as discounted sales, discounts on new menu items, or a free wine tasting, you’ve given them a reason that’s valuable enough for them to exchange their email address with you. They might share with their friends and family so that they too can get in on the action! 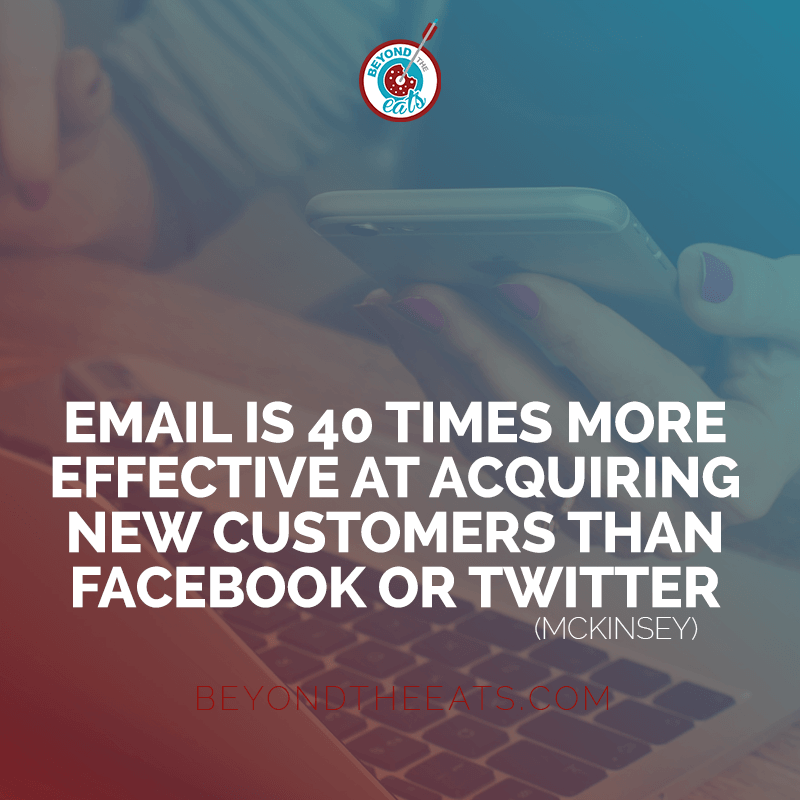 According to McKinsey, “Email is 40 times more effective at acquiring new customers than Facebook or Twitter”. So, what are you waiting for? Staying top-of-mind is what email marketing is all about. 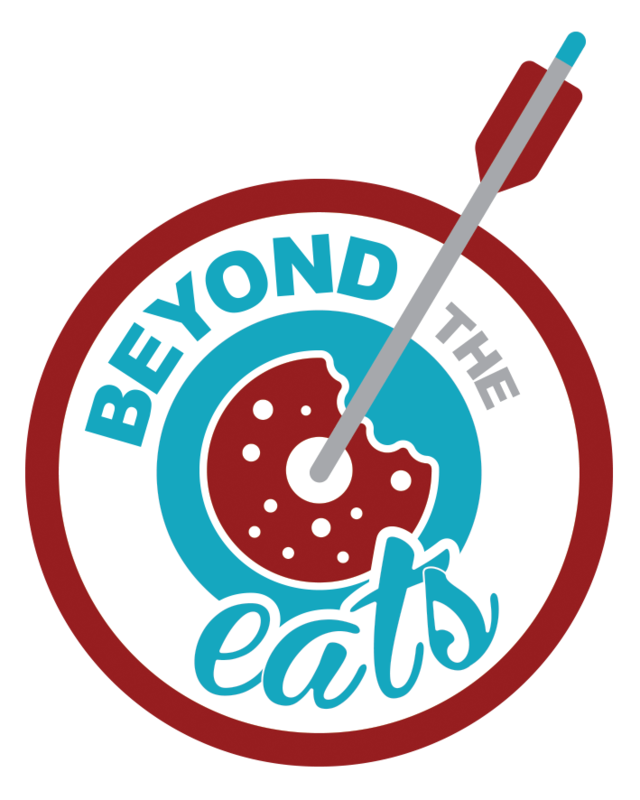 The restaurant industry is very competitive and it’s important to stay present in your customers’ minds very often as they focus their attention in different places and are distracted by so many different messages per day. Email gives you direct access to somewhere that people check on a regular basis, so you are always in control of the conversation between you and your customers. When you keep your customers informed about your new deals or restaurant updates, you stay at the top of their minds. This naturally increases your chances of creating loyal customers and bringing in repeat customers. The great thing about email marketing is that you can target your marketing efforts towards specific groups of customers. This makes your restaurant marketing much easier and cost-effective because it’s much more scaled down to tailor to specific needs. You can break your consumers into segments based on their needs, and then concentrate your marketing efforts on each segment by matching your service offerings with them. 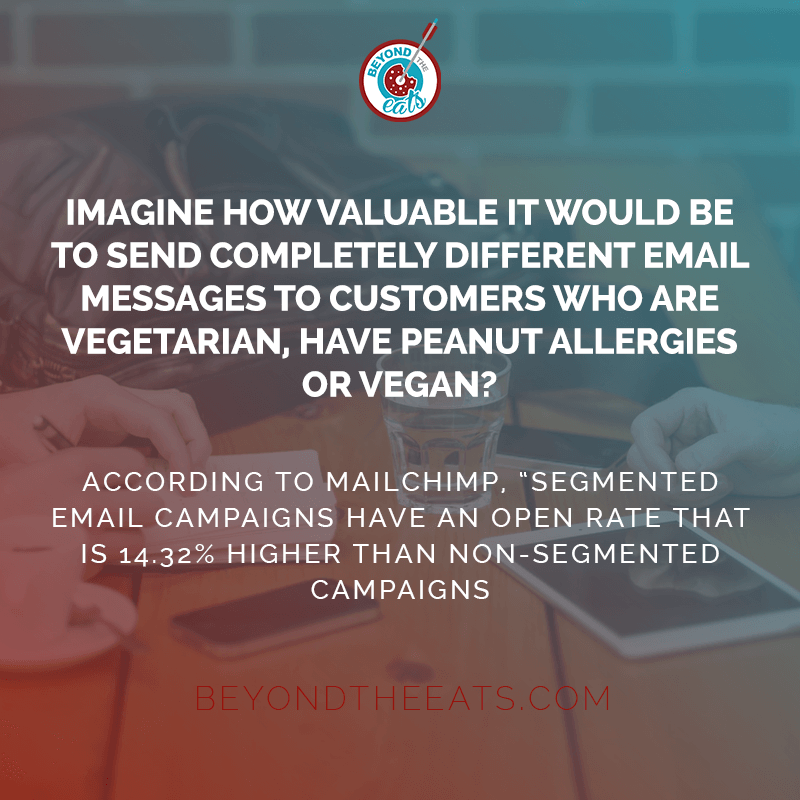 For example, imagine how valuable it would be to send personalized & completely separate email messages to people who are vegetarian, have peanut allergies or vegan? Very powerful. The experience is much more personal. This intimate and personalized connection is powerful, to say the least. According to MailChimp, “Segmented email campaigns have an open rate that is 14.32% higher than non-segmented campaigns, meaning that it’s clearly something people enjoy more as it’s personalized to their specific tastes and satisfies their specific needs. The proper use of targeted or segmented marketing will help you really connect with your existing customers, increase your sales and grow your restaurant business. You can start email marketing on a shoestring budget and still achieve amazing results. In fact, email marketing is much cheaper than most other marketing channels. There are several email marketing services – free and paid tiers that you can use. If you just want to see if email marketing is for you, I’d suggest starting with MailChimp. But if you’re looking for something with more powerful and advanced features that can help you serve your customers, I’d recommend checking out ActiveCampaign. I typically recommend ActiveCampaign for restaurants because it offers powerful automation that you can easily customize, and it is also a CRM (client relationship management) system. An ActiveCampaign Lite account will cost just $9 per month for up to 500 contacts to get started! Is it possible for restaurants to boost sales with email marketing? Well, the short answer is – DEFINITELY. In fact, email could become your number one top-secret weapon to increase your business sales and grow your customer base. 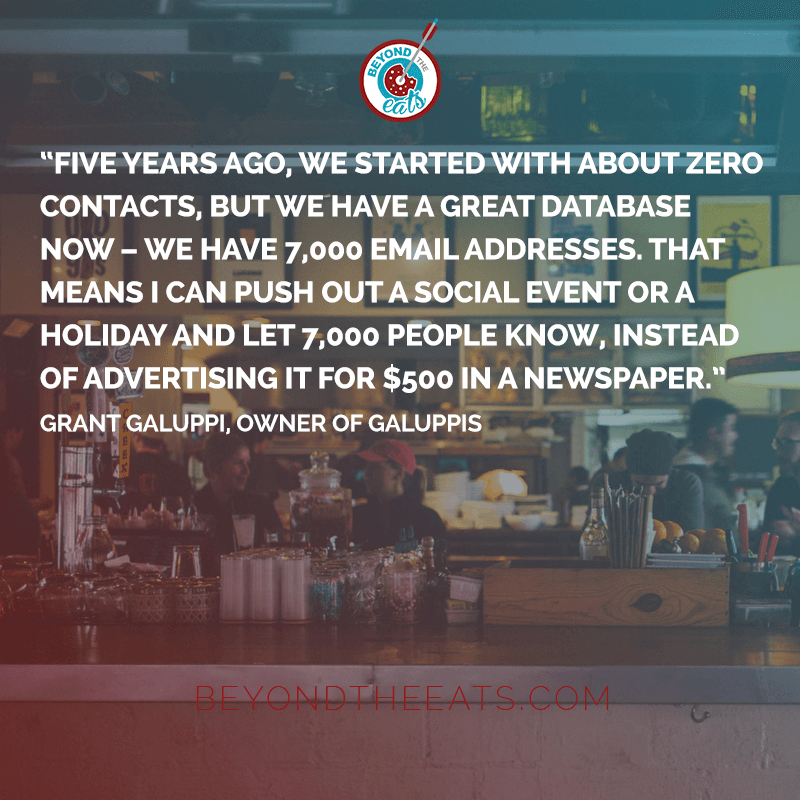 This quote from Grant Galuppi, owner of Galuppi’s illustrates the power of having your own email list. I’m sure you can imagine how valuable it would be for you to be able to reach almost 7,000 customers instantly. 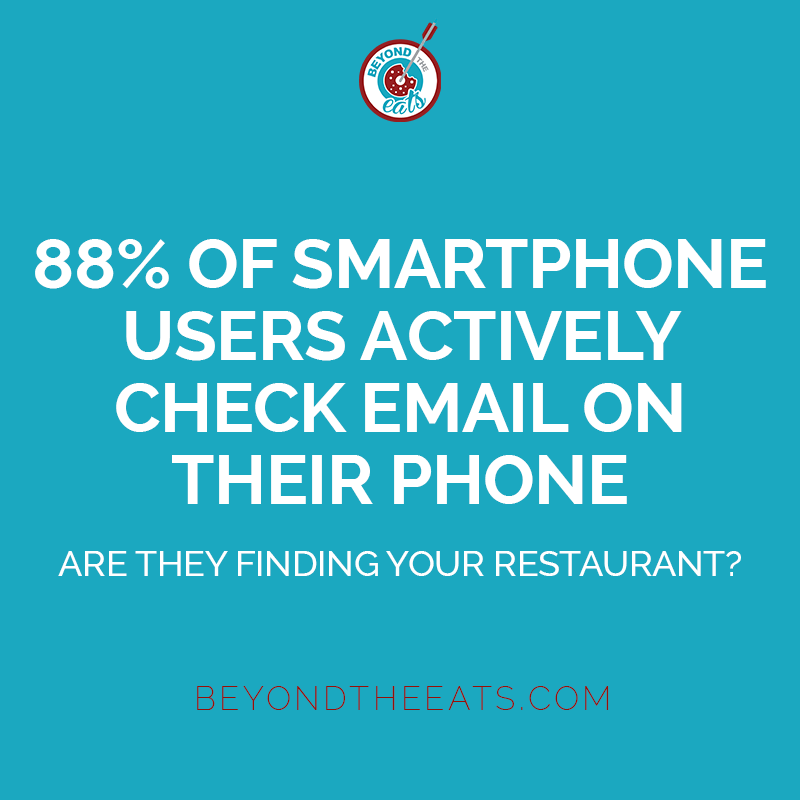 Although this number can seem like a far reach to get to, it is possible if you implement the right systems within your restaurant for people to share their email, and consistently serve them relevant offers. Speaking of the right systems, the next step is to get started! Getting started is easy and you can be up and running in under one hour. So, don’t feel intimidated by the process. One important thing to know is that collecting emails should be something that you get into a rhythm with as a restaurant owner. Your subscriber’s list is an asset to your restaurant business and you need to look for effective ways to collect emails consistently. What can you offer that’s valuable enough for someone to share their email with you? A free lunch? 25% off? A free drink? Giving people something just once can create a much longer relationship, which makes it worth it. I’ll detail many ways that you could go about this in a later post, but for now, it’s important that you try to maximize on your foot traffic by connecting with them through email. Similarly, you can make use of other channels such as your website to collect emails. When you have an email list, you can command traffic to your restaurant every time you want. Nowadays, mobile devices are unquestionably the most extensively used. We carry them with us in our bags and pockets, check them when we have any moment of downtime, and they’re always on our bedside tabletop when we are asleep. Statistics show that 88 percent of smartphone users actively check email on their phones, which makes it more popular than any other app for both iPhones and Androids. Thus, mobile is a great opportunity for you as a restaurant owner, as it gives you unlimited access to your customers no matter where they are. A more advanced step in your email marketing system would be to focus on how you can create the perfect “mobile moments” by sending emails to your customers at the right time, but I’ll save that for another post. I hope you can now see the huge opportunity available through email marketing and why you need to use email marketing for your restaurant. 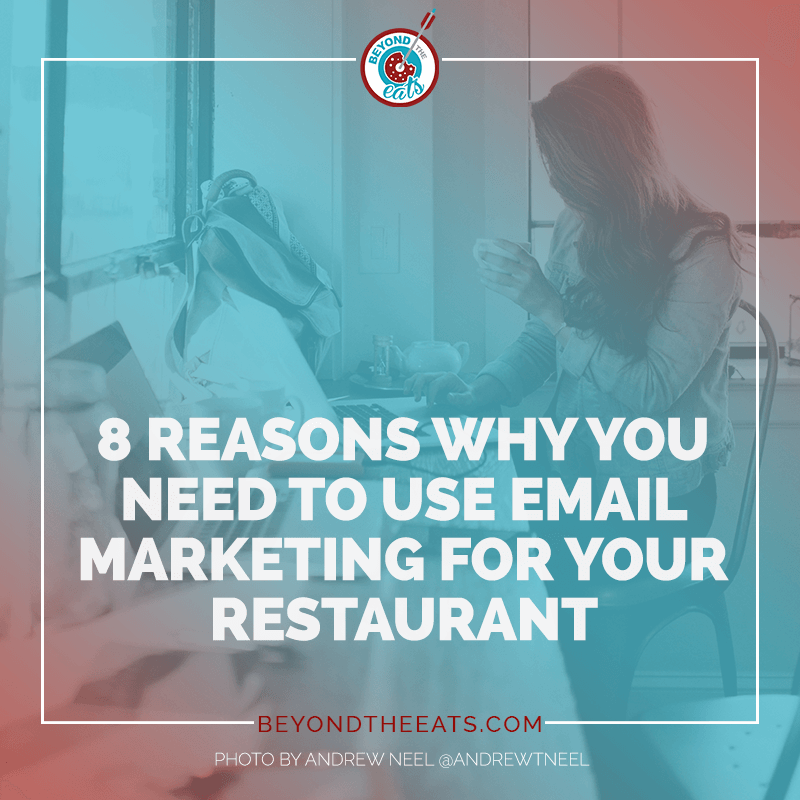 Email marketing offers restaurants tons of opportunities to help achieve their business goals and I hope you now understand how large of an impact it can have when properly done. You can easily connect with your customers, build a lasting relationship and stay ahead of your competitors. 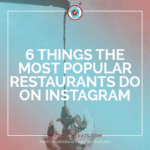 Of course, social media is also important, so you might also want to check out these posts where I walk through 6 Facebook post ideas that will keep your restaurants customers coming back & 6 things that the most popular restaurants do on Instagram. Have you used email marketing before or want to get started? What was your experience like? What questions do you have? Let me know in the comments!